The perfect finishing powder for the face, eyes, lips & body. 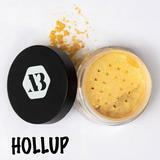 It is a finely milled loose powder safe to be used as highlighter, eyeshadow, bronzer & body powder. Apply the powder in small touches with your brush, blending thoroughly to create an even finish.